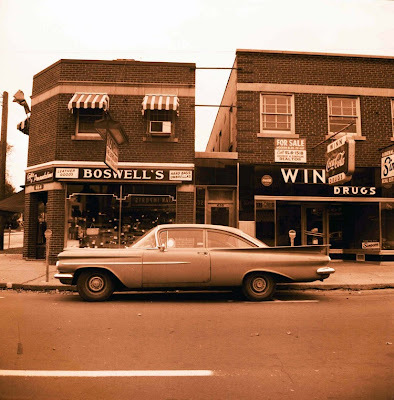 Below: Sept.28, 1965 - at the south-west corner of Queen St. and St. Lawrence Ave. was Boswell's gifts. To the right is seen an insurance sign, over a very narrow storefront that's probably not more than eight feet wide. Above: same view, Feb.27, 2009. 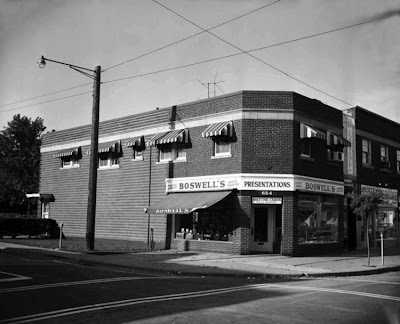 Below: Oct.4, 1964 - continuing west, Boswell's is at the left; next is the narrow office, built into what was a laneway between the two buildings; next is a black-vitrolite-clad Winn's Drugs with an overhanging plastic Coke sign. Reflected in Boswell's storefront window is the image of Oscar's Italian Imports sign, which was across the street. Check out the cars parked along Queen in these shots! 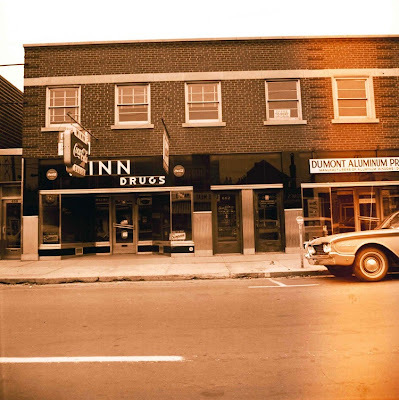 below: Oct.4, 1964 - heading west, Winn's is seen at left, Dumont Aluminum Products at right. 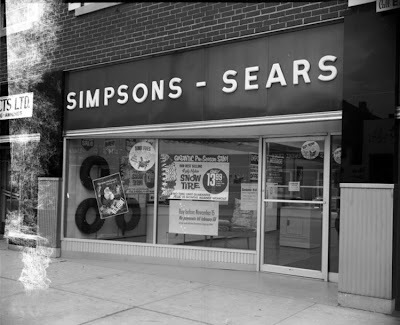 above: same view, Mar.2, 2009.
below: Oct.4, 1964 - Dumont's is at the centre, Simpsons-Sears is at the right. above: same location, Mar.3, 2009; Simpsons-Sears was at the right where the green sign is; closer view below, taken Jan.29, 2009.
above: Oct.5, 1965 -closer view of Simpsons-Sears. below: Oct.4, 1964 - continuing west along Queen St., Simpsons-Sears is at the left; a General Motors car dealership is next. Check out that wagon in front! And is that a Ford Galaxie at the left? And to the right of the wagon, behind the window inside the store, isn't that a Parisienne, or maybe a 65 Pontiac Strato-Chief, peeking out, with its signature vertically-stacked headlights? Above: same view, Mar.3, 2009. 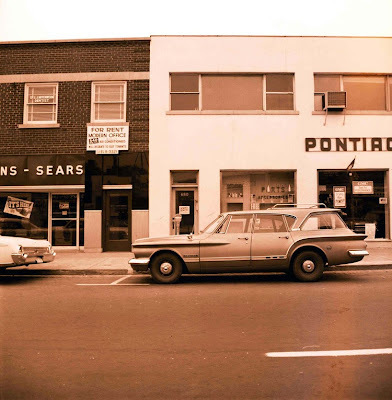 Below: Oct. 4, 1964, looking further west at the same building, advertising Pontiac, Buick and GMC. A sign in the window is advertising 1965 Pontiacs. Also a large neon sign is shown overhanging the sidewalk. 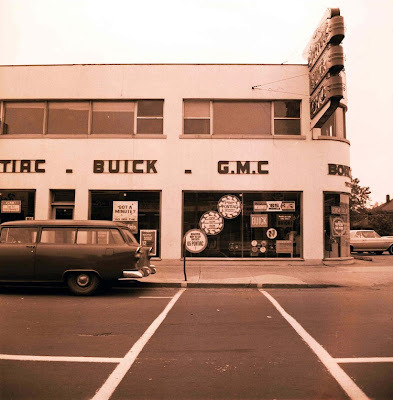 At this time the dealership was known as Border GMC - part of the 'Border' name is seen above the round-edged window at the right. 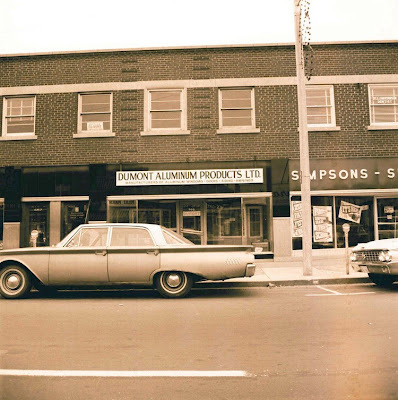 In the mid-1950's this was home for Stewart Bird Motors (aka Stu Bird), at 680 Queen St. By 1965, Pioneer Collision was located here. above: May 25, 2009 same view; styrofoam being installed in preparation for a stucco cover over the previous stucco coating; building to house a new brewpub. above: Mar.3, 2009 - looking south-east down Queen St. towards St. Lawrence Ave.
below: Mar.3, 2009 - looking at the west-side view of the former Bird / Border Pontiac dealership, with the former service bay doors running down near the back. The street corner (just barely seen curving at the mid-right) is the intersection of Queen St. and of (eastbound) Valley Way. above: Jun.4, 2009. Primer and finish coats being applied. above: July 28, 2009. The building facade now freshly painted. Interior front renovations underway. The 3-panel-glass corner, and the window to the left, are covered with plywood. below: heading further to the right (west) from the building above, the road in front becomes Valley Way here, because it diverges from Queen St. at this point. 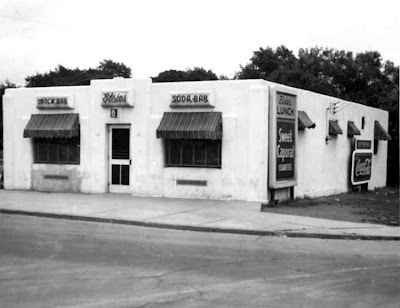 So, walking to the end of this block, you would be standing at the south-east corner of Valley Way and Buckley Ave.
On this corner, as seen in May, 1950, stood the cool Elsie's Lunch and Soda Bar. That was a neat looking diner / luncheonette which I would've liked to go to! Although NFLA notes it was on Queen St., Elsie's actual address was 710 Valley Way. In 1945 it was run by M.L. Stoner; in 1955 by E. Stoner. I suppose that at some point Elsie's was demolished to make more room for the car dealership's parking/sales lot. above: Sept. 2009 - the same view of the corner where Elsie's Soda Bar once stood, now a parking lot. The bit of building seen at the far left distance is a corner of the newly-painted old car dealership's rear service garage (which the brewpub would later occupy). The older photos in this study are from the Niagara Falls Ont. Library Archives; the recent photos are by R. Bobak. Thanks for visiting Right In Niagara ! Below: Feb.26, 2009 - looking at the Niagara Falls Review newspaper offices, at the south-west corner of Valley Way and Morrison St.
"F. H. Leslie owned this property for many years and in the late 1920's he built a miniature golf course on site - miniature golf was popular then but the novelty did not last. The lot remained vacant, except annually sold Christmas trees including Scotch Pine (a novelty then) when Mr. Petrie who lived in the house to the right. The House has since been demolished to accommodate an extension to the Review building." 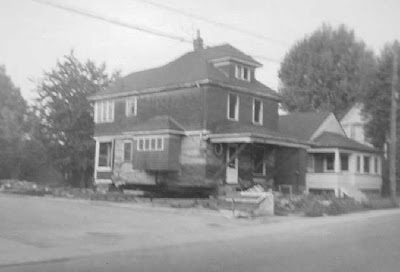 In this particular above photo's description, the Library Archive states the Petrie House was "demolished"; however, as will be seen further below, other photos in the Niagara Falls Library Archive show the Petrie House (seen above at the far right) being moved, not demolished; the Petrie House was moved from its location (facing onto the south-side of Morrison St., it had been the next house directly west of the rear of the Review building) to make room for an extension of the Review's office building, at some point ca.1960. Apparently, it still seems to be a mystery regarding where the Petrie House had been moved to. below: May 25, 1942 - looking west along Morrison St., standing on Valley Way. The description reads "the photograph was taken on the present site of the Evening Review building. The house to the left of centre is the Petrie homestead. The small square foundation at the left is what remains of the ticket office for the miniature golf course which F. H. Leslie built on this property during the miniature golf popularity of the early 1930s ...George Seibel". Note the Petrie House is plainly seen at the centre top of photo. above: Feb.28, 2009 - same view, looking west along Morrison St.; the Review building (corner left) now sits on the former mini-golf site. At the right, note same homes across the street on the north side of Morrison St.
below: Feb.27, 2009 - looking the corner of Park St. and St. Lawrence Ave., a house at this site was torn down during the week of Feb.16-20, 2009.
below: Feb.18, 2009 - a closer view of the house on Park St. looking from the west. below: Feb.26, 2009 - standing on the corner of Morrison and First Ave., looking along the south-side of Morrison St. towards the rear of the Niagara Falls Review building. above: the same view, ca. 1960, before an addition was constructed at the rear of the Review building, the door and corner of which is seen at the far left. The three-story house in the centre is the Petrie House. The same gabled smaller home (at the far right) can be seen in both above shots. 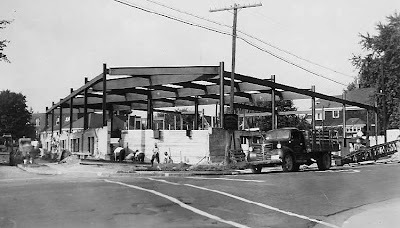 above: ca.1960 - the Petrie House is seen raised up off its foundation walls. above: The Petrie House is now seen sitting several feet to the east from its original foundation; it is now sitting on wheels, partially in the Review's parking lot, with people (who were they?) seen standing on the wheels and waving, under the still-attached front porch canopy. Note that the third floor has been completely removed. "House was West of the Niagara Falls Review Building. The house was moved from the site to make room for an addition to the Review building ca. 1960 plus or minus - Date can be ascertained from date of Review addition. Don not know where house was relocated. 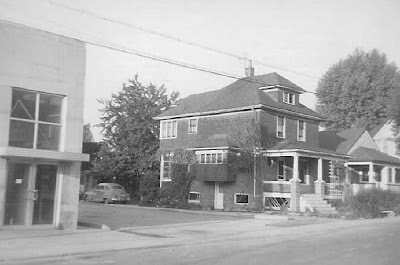 As a sidelight, the Seible family lived in the petrie house during the winter of 1939-40 when Mr. Petrie took his family to live on a farm near the Sodom road South of Chippawa. It was his contention that if they lived on a farm his two older sons would not be pressed into military service. The farm lacked standard amenities and it was a hard winter as the Seibles had no lease they were given notice to vacate in the spring of 1940 and the Petries family moved back to town. " Unfortunately the info with the photo above doesn't say where the Petrie House was moved to!!!! It is interesting to consider whether the house that was torn down last week (during Feb.16-20, 2009; seen below on Feb.17, 2009) on Park St. could have been the lost former Petrie House. Was the Petrie House moved to Park Lane? It would have been a relatively very easy and short move, to tow the house down the street a couple of blocks, from Morrison St. down to Park St. It was interesting to find, after the Park St. house had been demolished, that its foundation walls were of newer concrete block, not of rubble stone, as would have been normal of a house of the construction style that the Park St. home was. The Park St. house also had a newish single-layer veneer of brick on it, over a siding of rough-cut planks; again, unusual for a house of that age, which would have had load-bearing double-brick walls, not veneer-brick, wood-frame-walls, as the Park St. house had been; it was probably originally wood-sided (as the old Petrie house had been) and had a brick veneer installed on a new block foundation on the new site. 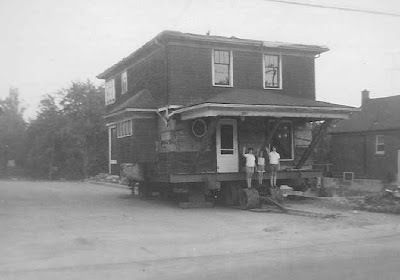 The original third-story of the wood-sided Petrie House (as seen earlier) had a hipped-roof with a hipped-dormer, however, that was all removed prior to the move, as the Petrie House is seen on wheels with no third-floor. Certainly the third-story could have been rebuilt into a gable, as the house on Park. St. had, and the left-side bay window moved slightly to the rear. This house, at the end of Park Lane, behind the Michigan Central tracks, also didn't fit into the style of the other homes to its east on Park Lane. above: Feb.17, 2009 - looking north-east along Park St. from St. Lawrence Ave.
Could the house (seen at the left) which had stood as the last house at the west end of Park Lane all these years, have been the lost (and then lost again?!) former Petrie House? 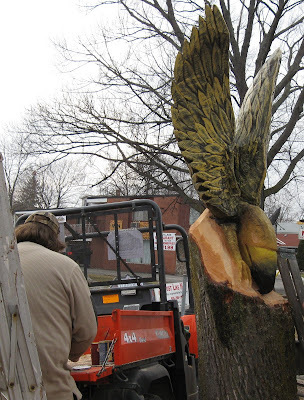 On Feb.26, 2009, while having a coffee at the always-friendly-service Timmy's in Chippawa, I met wood sculptor Rich Bailey working on his Thunderbird, which he had carved out of the main trunk of a maple tree recently cut down by the city. The wings are actually carved from two trunks of the tree as it branched up. He had sculpted the tree-trunk into a Thunderbird eagle last week with a chain-saw, then afterwards worked details with a chisel. Today he was painting. above: Feb.26, 2009 - artist Rich Bailey works on his Thunderbird. That's the Chippawa bridge at the left, which crosses the Welland River (also known as Chippawa Creek). Front St. is to the right; Macklem St., which leads directly to Niagara Falls about five minutes away, is off to the left. Photos by R. Bobak, taken Feb.26, 2009. Click on photos to enlarge! The carved Thunderbird eagle is in front of the Tim Hortons, near the south-west corner of Portage Rd. and Front St., just west of the Welland River. The Chippawa Timmy's chipped in help create the carving. "Media mogul Rupert Murdoch apologized in print yesterday for a cartoon that ignited protests from readers who saw it as a racist depiction of U. S. President Barack Obama as a chimpanzee. The Murdoch-owned New York Post had issued a partial apology in an editorial, saying no apology was due to "some in the media and in public life who have had differences with The Post." That was seen as a reference to civil rights activist Reverend Al Sharpton, who led the protests against the cartoon. But this failed to quell the uproar, leading to the proprietor's mea culpa, published yesterday in the paper. "Today I want to personally apologize to any reader who felt offended, and even insulted," said the 77-year-old head of the media giant News Corp., which owns the Post. "We all hold the readers of the New York Post in high regard and I promise you that we will seek to be more attuned to the sensitivities of our community." 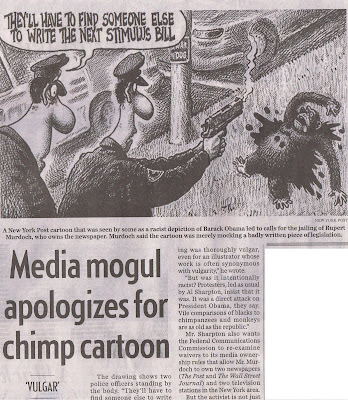 The Sean Delonas cartoon of a policeman shooting an ape played on the real shooting of a pet chimpanzee in Connecticut. A 14-year-old chimp named Travis went berserk, nearly killing its owner's friend and attacking a police car. The drawing shows two police officers standing by the body. "They'll have to find someone else to write the next stimulus bill," says one. The drawing ran a day after Mr. Obama signed into law the US$787-billion economic stimulus he had strongly promoted, and the connection offended those who likened it to the racist historic comparison of blacks to monkeys. Demonstrators led by Mr. Sharpton chanted "End racism now!" outside the News Corp. headquarters and called for the jailing of Mr. Murdoch. The newspaper initially defended the cartoon as a parody of Washington politics, but Mr. Sharpton said it exploited a potent image in the history of racism toward black people. "I have had conversations with Post editors about the situation and I can assure you -- without a doubt -- that the only intent of that cartoon was to mock a badly written piece of legislation. It was not meant to be racist, but unfortunately, it was interpreted by many as such," Mr. Murdoch said. Meanwhile, Clyde Haberman, a New York Times columnist, said calls for the government to get involved were misguided. "At a minimum, the drawing was thoroughly vulgar, even for an illustrator whose work is often synonymous with vulgarity," he wrote. "But was it intentionally racist? Protesters, led as usual by Al Sharpton, insist that it was. It was a direct attack on President Obama, they say. Vile comparisons of blacks to chimpanzees and monkeys are as old as the republic." Mr. Sharpton also wants the Federal Communications Commission to re-examine waivers to its media ownership rules that allow Mr. Murdoch to own two newspapers (The Post and The Wall Street Journal) and two television stations in the New York area. But the activist is not just concerned about control of the media. He also wants the government to oversee editorial content. "Thus did he take the first step down a very slippery slope," the columnist notes. "The First Amendment protects even the most despicable form of expression from government interference. It is why the Supreme Court has upheld the right to burn an American flag even though flag desecration is as offensive to many people as Sharpton says this cartoon was to him." Mr. Haberman goes on to cite the case of Carl Wilhelm Baumgartner, who was born in Germany in 1895 and became a naturalized American in 1932. He was also an outspoken supporter of Hitler and the Nazis, so much so the government tried in the Second World War to strip him of his American citizenship. The case went right up to the U. S. Supreme Court, where the justices finally blocked that effort. As Mr. Haberman writes, Justice Felix Frankfurter, who was Jewish and hardly enamoured of Nazis, wrote in his majority opinion: "One of the prerogatives of American citizenship is the right to criticize public men and measures -- and that means not only informed and responsible criticism but the freedom to speak foolishly and without moderation." It is an American right to express "silly or even sinister-sounding views," he added. Reuters; With Files From The New York Times." Give enough typing monkeys enough time, and they will be able to write a Shakespearian play...or a tax-and-spend stimulus bill. It's really jumping to outlandish, perhaps delusional, conclusions that the monkey was supposed to be Barack Obama. American liberals would laugh their asses off if that was say, a caricature of G.W. Bush, in the very same circumstance. In that case, no-one in the U.S. would be squawking to 'take control of the media and its editorial content'!! For years, it was OK - appropriate, acceptable, and culturally expected - for liberal nutbags to depict Bush as Hitler; (in St. Catharines, Pulse Niagara did just that in a story photo several years ago); but draw a flicking cartoon monkey and today liberals are demanding sweeping state censorship? Has the excited states of America gone bananas? Referring to my recent post, Where's the funny cartoon showing Liberal Premier Dalton McGuinty being assaulted?, what if the same cartoon was published in Canada? Here, Prime Minister Stephen Harper's Conservative federal government has also unveiled its stimulus package. Who's to say this cartoon is only U.S. specific? Could the cartoon not be taken as also meaning that the Canadian prime minister's stimulus bill could have also been written by a tax and spend happy monkey? Liberals in Canada would then be applauding the same cartoon!! But - wait a minute: Ontario's Liberal Premier, Dalton McGuinty, will soon be unveiling his provincial budget, which as we all know by now, will also be full of "stimulus spending", so would the same cartoon apply to him? Oh, oh...in that case, Canada's Liberals would freak out and instantly denounce such a cartoon!! During the 2003 Ontario election, Dalton McGuinty was referred to as an evil reptilian kitten eater from another planet; Liberals at the time almost plotzed in their knickers over this caricatured characterization. Can you imagine them getting upset over a monkey? At least a depiction of a politician as an alien reptile is so much more refreshingly creative! Nevertheless, it was a prescient comment on the Liberal liars that McGuinty's government turned out to be. Why, I can see McGuinty right now, typical Liberal, slithering under a dark rock, flicking his forked tongue and devouring our taxes. What if the New York Post's cartoonist had instead drawn, not a monkey, but the Democratic Party's mascot, a donkey, as the focus? Would that be racist? Would that be akin to calling the President a jackass?? Change one letter, from 'm' to 'd', and the accusations go away?? Why would that be a problem today if it wasn't a problem for Andrew Jackson in 1828?? Americans enamoured with Obama's announcement this week to create some kind of mysterious fund for universal health care, should examine the deception practised by Liberals here in Ontario for years. A state-run health care monopoly is going to be a very expensive, and ultimately unreachable, goal. For goodness sake's, don't look to Ontario's disastrous health care system as any kind of template, guide or role model - see Liberal Healthcare Duplicity, An Ontario Overview 2003-2007 for the frightening details of life under a state-run health monopoly. The emergency room is no place for politics? Tell that to a Liberal! "A number of years ago, an asthmatic died en route to a Toronto hospital. Apparently, the ambulance carrying the boy could not go to several closer emergency rooms because these were filled to capacity with acutely ill patients. They could not accommodate a patient who would likely need intubation and respiratory support. A system designed to prevent ERs from being overwhelmed beyond their limit was in place. The intent was to ensure that ERs were not in danger of providing suboptimal care. Once the capacity to handle critical patients had been reached, ERs could register online and request that they be bypassed entirely (CCB, or coronary care bypass) or partially (RDC, or redirect consideration). Unfortunately, as the demands made upon these departments grew, the incidence of CCB and RDC requests rose. Sadly, circumstances resulted in this patient not reaching an ER in time. No doubt, this tragedy should not have been allowed to happen. However, the response of government to this event was typically short-sighted. The processes of CCB and RDC were essentially banned. A directive was issued that appeared to be a potent and immediate response to an unacceptable circumstance. However, no long-term solution designed to address the system-wide problem that had led to the ER crisis was developed and implemented. As a result, ERs were expected to handle all visits regardless of whether they had the facilities or staff to do so. Over time, critical congestion within ERs has become the norm. Patients are piled up in waiting rooms, often lying on ambulance stretchers, anticipating the availability of an ER bed. But waiting times have increased dramatically because most of these ER beds are occupied by admitted patients. Matters have only worsened with hospital restructuring, particularly since the establishment of promised community-based infrastructure has never occurred. Last week, the matter of ER wait times was raised again, as the government issued a new edict to ER departments: Get wait times down to four hours for patients with minor ailments and eight hours for sicker ones. As part of the strategy, a new website has been set up, ostensibly to collect data and make everyone sensitive to the situation. Ontario Minister of Health David Caplan stated that this information will “open a lot of eyes in the province.” Whose eyes does he want to open? Certainly, those of us providing care are aware. Undoubtedly, after years of increasing waiting times and decreasing accessibility, the public perception is clear. Hospitals have been acutely sensitive to the issue for a long while, finally compelled to do what government should be doing — for example, finding ways to move chronic care patients out of acute care beds. One hospital has been directing dollars from its limited budget to pay long-term care facilities to take chronic care patients sooner. This is appalling. So, open your eyes, Mr. Caplan. The problem is not the hospitals — the problem is the system. Until the government takes a long-term, system-wide approach to a broad-based, system-wide predicament, the impact of what it does will be minimal: another bandage solution and nothing more." "The problem is the system" - and Ontario's single-payer, government-run health-care monopoly, championed by duplicitous, secretive, unaccountable Liberals such as St. Catharines Liberal MPP Jim Bradley, is a perfect example. Liberal Jim Bradley has based his entire career instituting his failing statist monopolist ideology upon Ontario's patients. For Liberals, politics most certainly belongs in the emergency room: hospitals and health care is where duplicitous Liberals peddle and seed their populist illusions that they are somehow 'helping' and 'saving' health-care - when the last thing anyone needs is any Liberal involvement in health care. Yet, that's exactly what hypocrite Jim Bradley and his Liberals have themselves been doing now in Ontario for five years!! McGuinty's smarmy Liberals have already been once caught playing their deceptive wait-time games, back in Nov. 2006, see: We've seen enough of McGuinty's Liberals ; see also Liberal Healthcare Duplicity, An Ontario Overview 2003-2007 , page 8. Abells asks Health Minister David Caplan, in Caplan's own words, exactly "whose eyes" does Caplan want to "open": patients's eyes? Doctor's eyes? Liberal eyes?! The only eyes that haven't opened, and which remain ideologically blinded by monopolist grandeur, are the eyes of LIBERALS themselves!! Does Caplan think that Liberals such as Jim Bradley will get anything from this web-site, other than a knee-jerk "oh,oh... it looks like we need more government intervention! We need to save health care... therefore, we need to cut health care budgets... American-style... Harris... bla...bla...blah..."? Abell's article says government must take responsibility for failed systems: but Jim Bradley and his McGuintyites apparently cannot believe that they are in any way responsible for their own health-care monopoly's failures. There is a disconnect in responsibility, accountability, and liability between what politicians do and the subsequent fall-out from their actions. Ontario's two-term majority Liberal government has no excuse but to see that McGuinty and his MPP's should be jointly and severally held liable for the health-care consequences caused by their unreasonable political perpetuation of a monopoly regime in this province. Their actions should not be shielded by their rhetoric. Standing along River Rd. at Ferguson Ave., the winter view across the Niagara River Gorge at the American side reveals the right-of-way of the old Great Gorge Route streetcar line that once circled the lower Niagara River. The streetcar route ran north (downriver, along the top of the gorge, on the Canadian side) from the Horseshoe Falls down to Queenston, where it crossed at the old Queenston-Lewiston Suspension Bridge into the U.S.; at that point, it was fairly low to the river, and so it began a gradual climb, winding south all the way upriver, through the Gorge, back to the Falls, where it crossed the Honeymoon (Fallsview) Bridge back into Canada. click on photos to enlarge! above: Feb.24, 2009, by R. Bobak. The former streetcar right of way can be seen as the white trail in centre of photo. The Whirlpool is not too far away, downriver to the left (north). The Whirlpool Bridge is upriver towards the right. The famous Niagara Whirlpool whitewater Rapids, very fast and turbulent, run here, between the Whirlpool Bridge and the Whirlpool. above: Feb.24, 2009 - moving upriver (south), the right-of-way trail can still be seen at the far left. But then continuing further towards the right, the streetcar right-of-way simply vanishes, due to years of rock slides. Note huge boulder along river at bottom right. above: Feb.24, 2009 - continuing looking upriver; the boulder at the left is the same one from previous photo, showing how the streetcar track right-of-way along this point has virtually disappeared. Where tracks once were is seen by the slight white line of snow, seen more to the right, running along the rock face a bit above the river. The Whirlpool Bridge is not too far to the right (upriver) from this point. above: closer view of fallen boulders near the river's edge. At the upper left of photo can clearly be seen a man-made stone wall, and part of the old rail right-of-way above it. What a breathtaking streetcar journey this must have been! below: On Aug.7, 1927, Edward, the Prince of Wales (later to become King Edward VIII) and his Royal entourage toured the Niagara Rapids by streetcar on the Great Gorge Route, as this postcard view from the Niagara Falls Library shows. I've often wondered where this photo was taken . . .
above: Mar.2010 - the ruins of this Great Gorge Route streetcar station and viewing area, where the future King of England Edward and his party once stood, can still be seen on the American side of the Niagara River. The stone steps and the lower viewing area are the same as in the old photo. The railings along the left side of the station, which are seen in the old photo, have since fallen down from the track-level into the lower level. 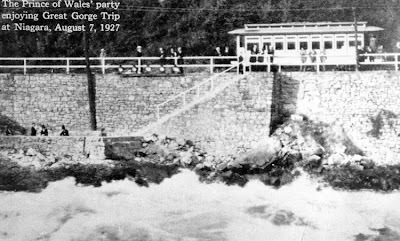 Before the tracks were built here, this had been the site of the Buttery Whirlpool Rapids Company, which had built two huge elevators to take tourists down to river level; later this same site became the "Whirlpool Rapids" stop for the Great Gorge streetcar route. By 1927, when the Prince had visited, the elevators were long gone, having been demolished by means of a controlled fire, in 1901. This site is located on the American side of the Niagara River, almost opposite from today's Whitewater Rapids Boardwalk, which is on the Canadian side. above: Mar.2010 - this view looks a little to the right of the stairs - this is where the Royals' streetcar was seen standing in 1927. The railings are still partially there at the top of the stairs, and towards the right. Note all the stone-rubble walls built to support the track right of way. above: Mar.2010 - looking just a little further to the right from the previous shot, following along the station's railing, the track right of way suddenly is covered with tons of rock. This view of the old streetcar station can be seen (from the Canadian side) when standing on River Rd., about halfway between Elgin St. and Buttrey St.
(Click on photos to enlarge!) above: Mar.2010 - this wide view looks at the cross-section of the Gorge which rises above the same station - the old station's stone steps are seen at the lower centre-left. At the bottom right is a bit of the Niagara River. During his visit to Canada, Edward, the Prince of Wales, also helped to officially open the Peace Bridge in Fort Erie on Aug.7, 1927, which was on the same day which he visited Niagara Falls. The day before, on Aug.6, 1927, the Prince of Wales officially opened Toronto's Union Station. Where's the funny cartoon showing Liberal Premier Dalton McGuinty being assaulted? The above Tim Dolighan cartoon appeared in the St. Catharines Standard editorial page on Feb.4, 2009. 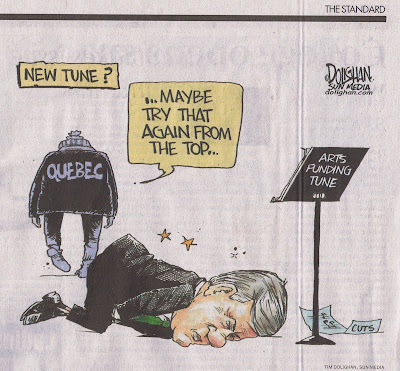 Hey, look...isn't that FUNNEEE... Stephen Harper's been kicked in the groin! Ha ha ha ... oh, he deserved that!! I mean, gosh, he tried to reallocate arts subsidies!! Why, that simply begs for violent retribution! Meanwhile, Ontario Premier Dalton McGuinty cuts $50 million in nurse funding from his already under-funded health-care monopoly, and there are NO cartoons in the St. Catharines Standard showing Liberal Dalton McGuinty being kicked in the balls, by anyone!! No cartoons of health care monopolist MPP Jim Bradley being booted in the scrotum. Nothing of health minister David Caplan getting hoofed in the nuts. Nothing of Michael Ignatieff being bashed in the family jewels. Not even any cartoons of mayor Brian McMullan being assaulted. I guess this stuff is only funny if it's a conservative being attacked. Well done, Sun Media. Good choice, Standard. Next thing you know, the St. Catharines Federal Liberal Riding Association will make jokes about assassinating Canada's Prime Minister.